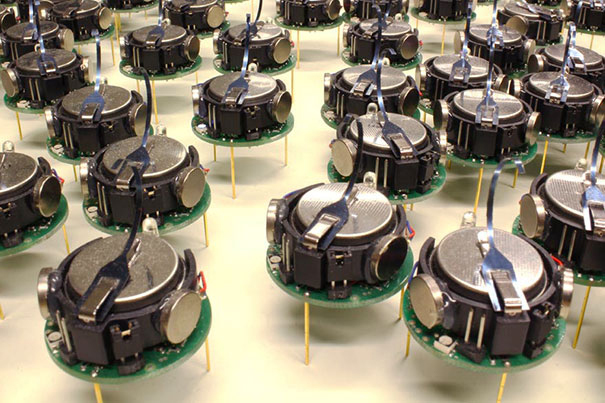 Some folks at Harvard University in America have developed over a thousand tiny robots called “kilobots”. The kilobots are very simple – they are about the size of a coin, have three legs, a battery, a sensor to figure out where they are relative to others, and a way to communicate with others. Their legs vibrate and that is how they wobble around. What is fascinating about them is how a shape can be sent to them, and they work together to form that shape. If the kilobots end up in a traffic jam, nearby kilobots have the ability to sense a problem and work together to resolve it. A team at Harvard has also worked on another type of robot that is able to assemble itself and then crawl away. Here are two videos showing both robots.